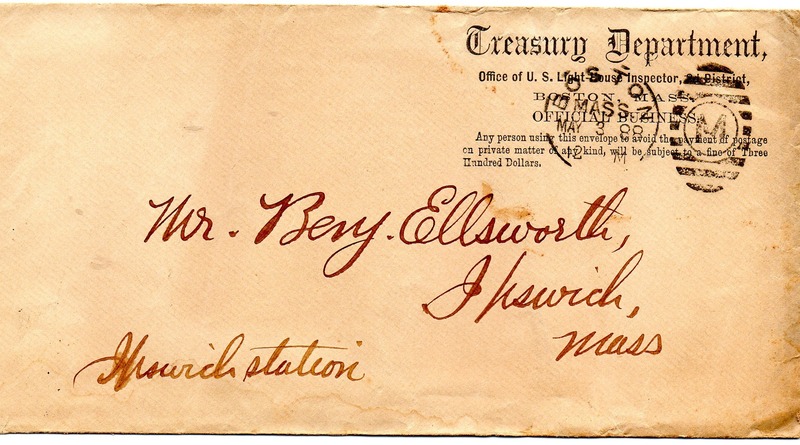 Benjamin Ellsworth was appointed keeper of the Ipswich lighthouse by Abraham Lincoln in 1861. With his daughter Susan, he remained at the station until his death in 1902. 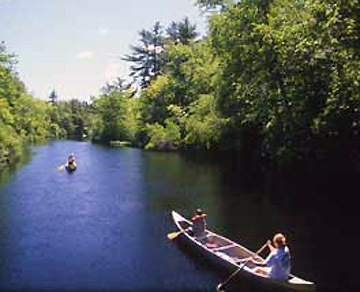 In 1837 the U.S. government erected two 29′ towers for guidance to the mouth of the Ipswich River along with a lightkeeper’s residence. The lighthouses were aligned such that they would provide guidance into the river’s mouth. The westernmost tower soon was updated with a revolving light. 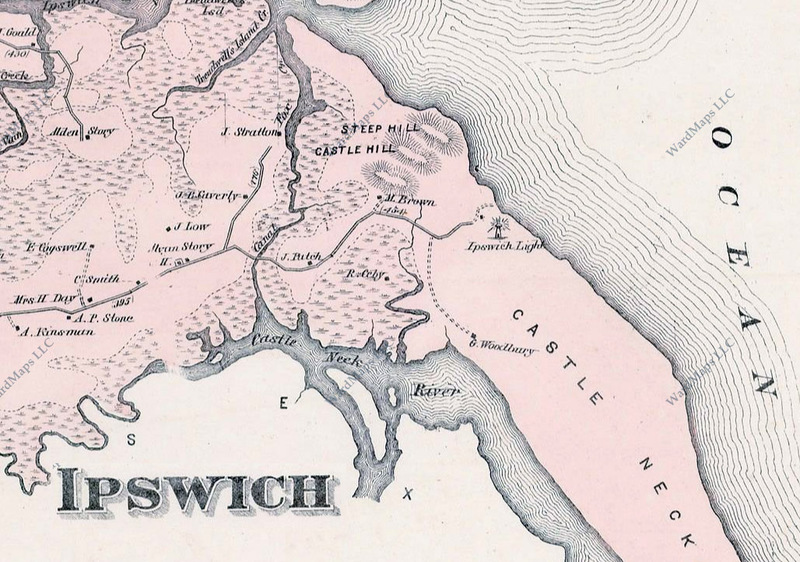 The first keeper of the Ipswich Light was Thomas Smith Greenwood, a native of Boston. 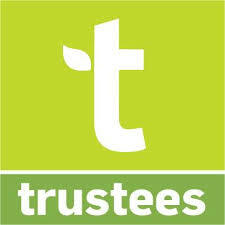 Greenwood owned a large tract of land that is now operated by the Trustees of Reservations as the Greenwood Farm Reservation. 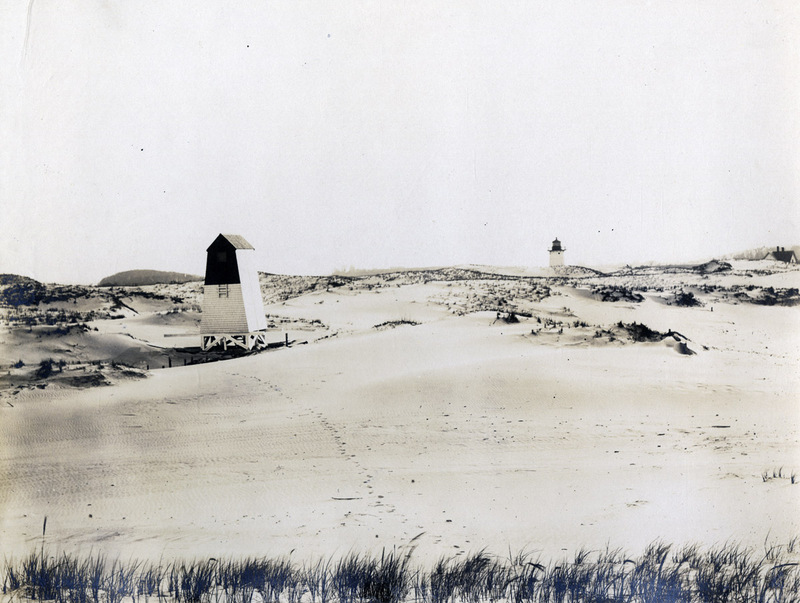 During a hurricane in 1839 a schooner the Deposit ran aground close to the Ipswich Range Lights. Keeper Thomas Greenwood swam to the ship pulling a lifeboat with a Mr. Marshall in it. The captain’s wife was saved but her husband and other crew members were lost. Joseph Dennis became keeper in 1841. There was ongoing concern about changes in the channel and the position of the light. 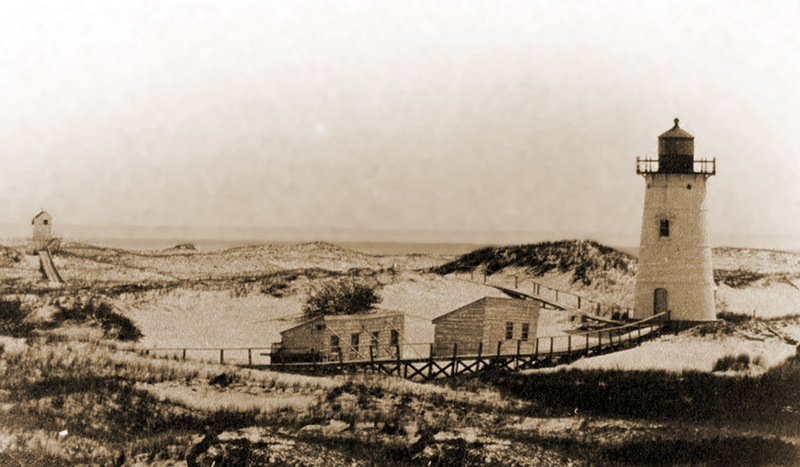 It was observed that the channel had moved so much that a ship would run ashore at Plum Island if they followed the lights, and the front light was replaced by a “bug light.” It had to be moved 550 feet in 1867 because of continued shifting in the channel. 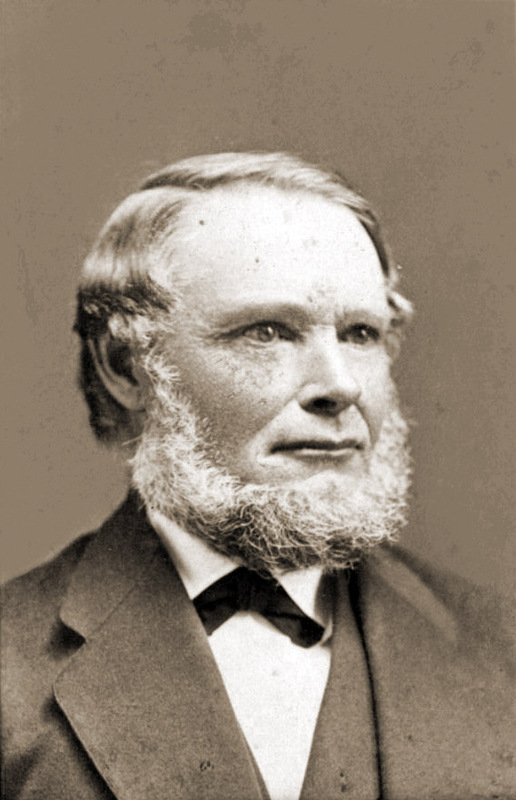 Benjamin Ellsworth was appointed keeper in 1861. Ellsworth’s wife died soon after he took the position, and the keeper’s daughter, Susan, kept house at the station. Susan was the youngest of 12 children. Three sons of Keeper Ellsworth fought in the Civil War, and all three returned safely. Benjamin Ellsworth would remain at the station until his death in 1902. “The fishing boat Garibaldi, Capt. George “W. Morgan, of Lanesville, engaged in the shore fishery, was caught in the gale of Tuesday, March 11th, 1872, off Ipswich, while attending to the trawls, and, being unable to carry sail, was soon driven ashore on Ipswich Bar, and sunk within two minutes after striking. Capt. Morgan had with him his partner, Mr. Levi Lane, and their only hope of escape was by clinging to the mast until assistance came. Here they succeeded, after much effort, in lashing themselves for their long and perilous watch through the night that was coming on, if indeed they should live to pass that watch. Cold, benumbed and wet, with only a faint hope of holding out, the long hours of the night passed wearily. At midnight they saw the keeper of the Ipswich light go and return from his duties ; yet no help came. The Ipswich lighthouse, with Steep Hill in the background. This photo was taken before 1910, when the first Crane Castle was erected. 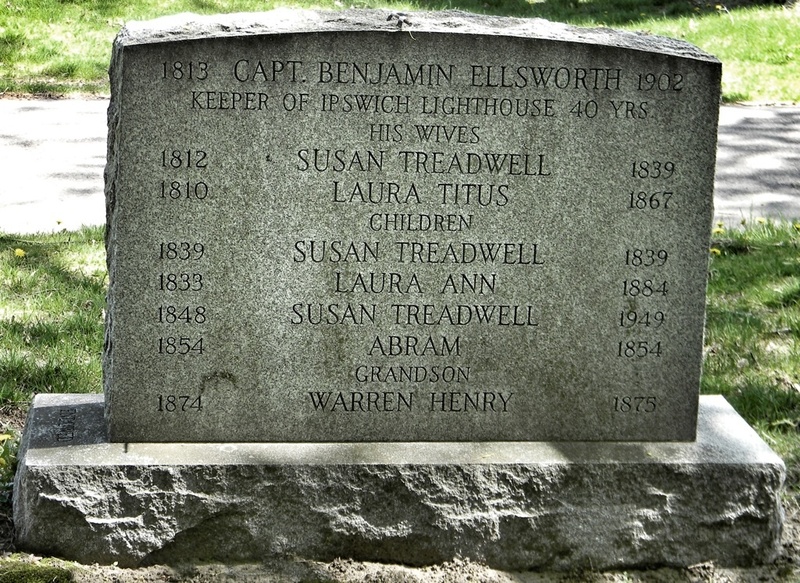 After Benjamin Ellsworth’s wife died, his daughter Susan Treadwell Ellsworth lived with him at the lighthouse and assisted with the duties. 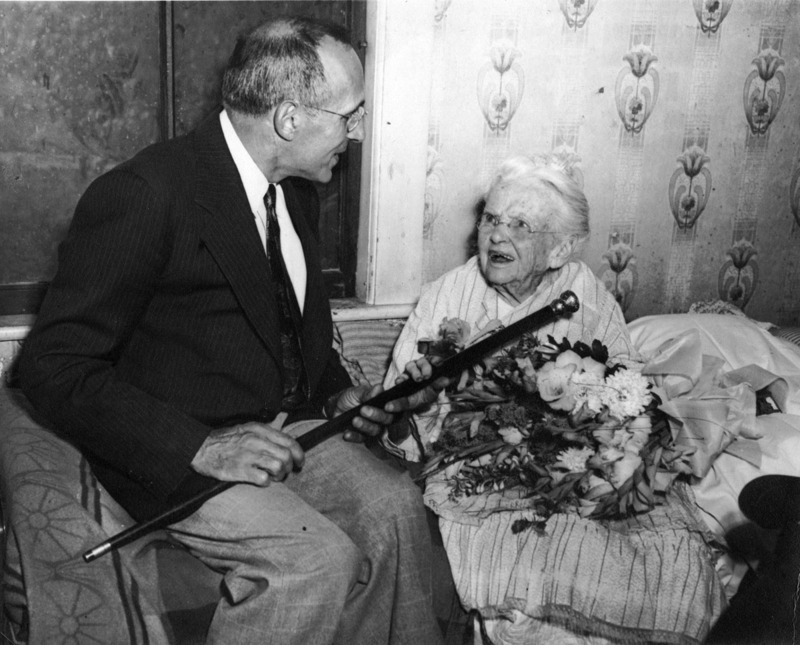 In this photo provided by Laurie Short Jarvis, she receives the Boston Post Cane as the oldest resident of Ipswich, and died at the age of 104 years. In 1881 the rear tower had been badly damaged by the pressure of accumulated sand along its base, and was replaced by a conical 45-foot cast-iron lighthouse. The front light was replaced with a movable base. Charles Wendell Townsend wrote in 1913 that the sand had shifted so much that the lighthouse was 1,090 feet from the high water mark. 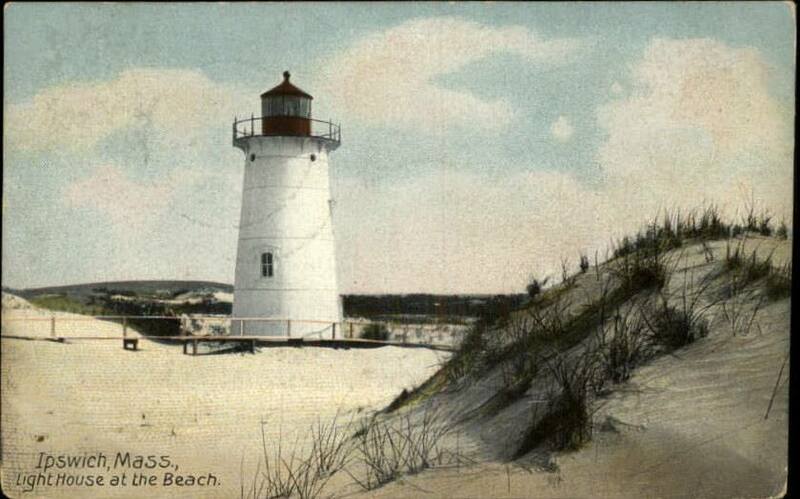 Use of the light was discontinued in 1932 and by 1938 sand had filled around the base of the tower. The Ipswich lightkeeper’s house. 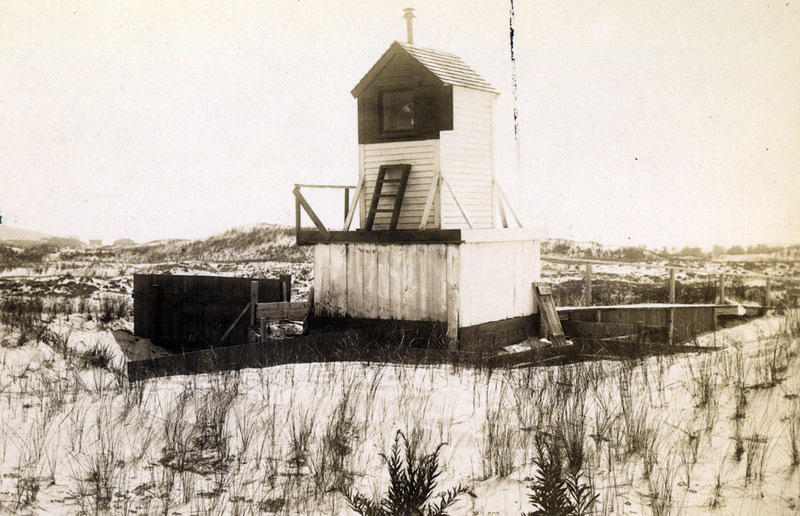 The Ipswich Range Light had been enveloped by sand by 1913. By then access was possible only by going through a window that was now at ground level. 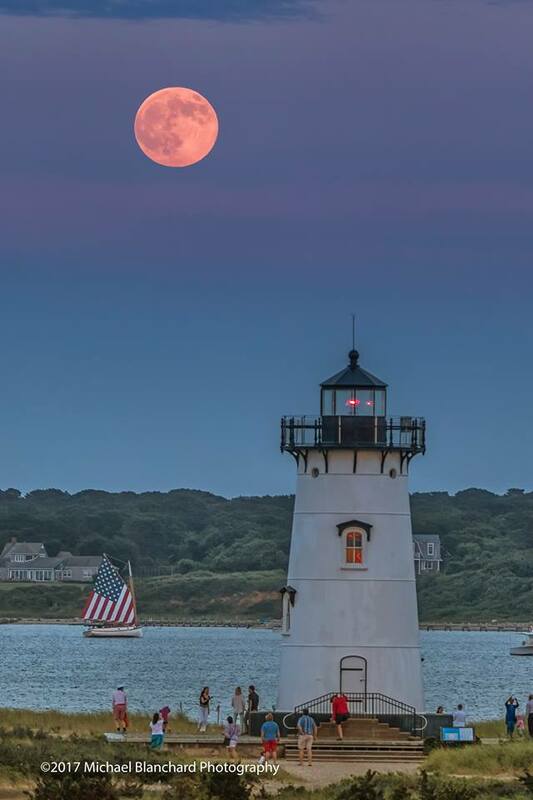 In 1939 the Coast Guard floated the entire the cast-iron lighthouse to Edgartown on Martha’s Vineyard to replace a lighthouse that had been damaged by the 1938 hurricane, and a steel skeleton light was erected at Crane Beach. It emits a white light every 4 seconds. 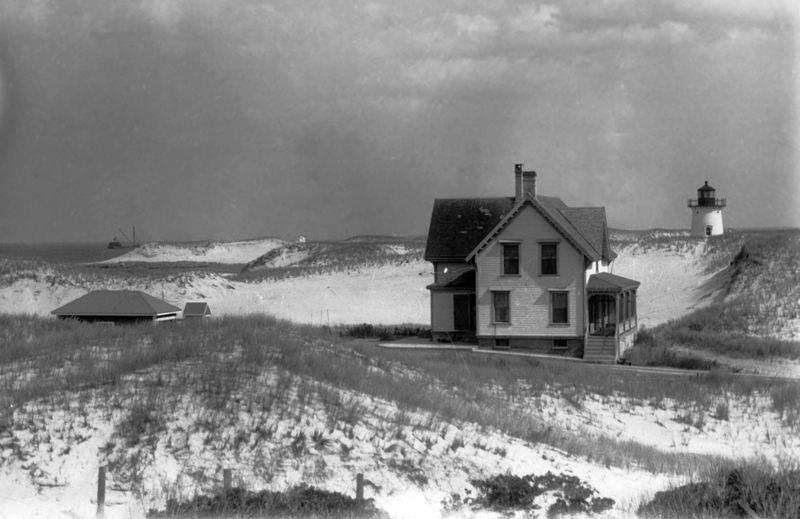 May 1, 1919 to June 8, 1922: G. F. Woodman, Jr.
At the close of November 12, 1932, the Front Range Light was discontinued and the Rear Range Light made automatic thereby dispensing with services of a Keeper at the station. 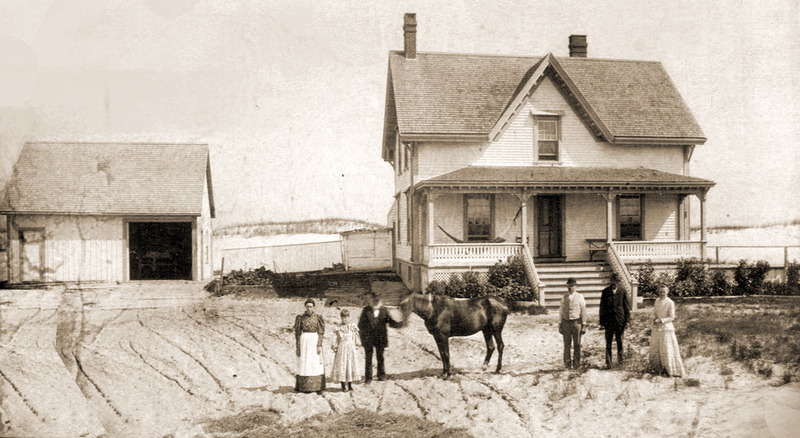 In 1934 my family, Dad, Leroy Lane, Mother, Angie, Brother, “Rusty”, Sister, Barbara, and I moved to the Keeper’s House at Crane Beach. After the stock market crash of 1929 and the depression following it my father’s business making radio tubes in Salem failed. Dad, two brothers and another man owned a business located at the corner of Derby and Lafayette Streets in Salem. Jobs were extremely scarce so we considered ourselves very fortunate that he found work. Dad became a lighthouse keeper. The lighthouse had been illuminated by oil lamps, but was automated with electricity about 1932. His duties consisted of changing the bulbs when one went out. There were two lights, one above the other, and when the top light went out, the lower one automatically came on, then he needed to put a new bulb in the top light. The ‘bug” light further down the beach was moved by a team of horses whenever the channel shifted with the tides and wind. The bug light was discontinued after the light was automated. The Lighthouse Service was disbanded in 1932 and the United States Coast Guard took over the operation of all lighthouses about 1939. But while we were there the Crane family was responsible for the keeper’s pay and my father also worked on the Crane estate during the day. The road to the beach was very poor then and we often had to walk a dike across the causeway to get to the house and to the school bus stop when the tide was high because the road flooded. 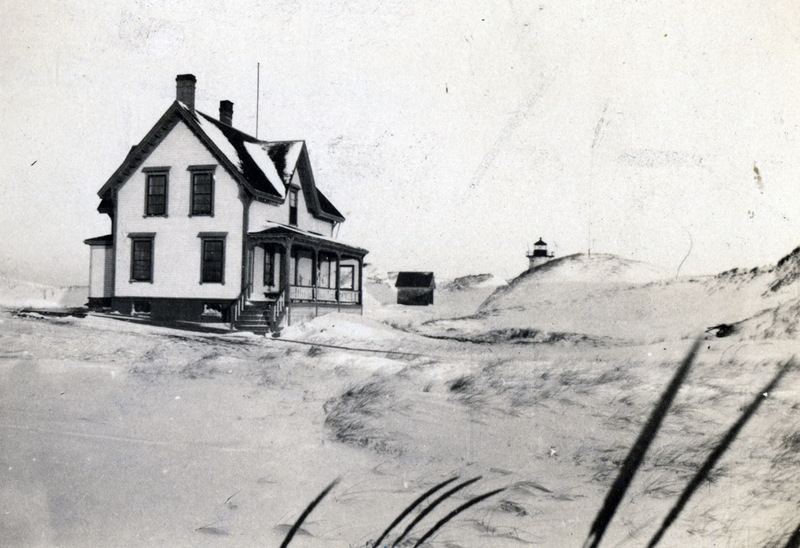 I remember one storm when the waves broke through the dunes between the Keeper’s House and the water and we found ourselves with the waves breaking on one side of the house and then rolling on pass the house leaving us in the middle. The house was well-built with one-foot thick walls of brick so it survived storms well. When we moved in we were told by the previous keeper that we would inherit a cat. It seems that the former keeper’s son harassed the poor cat so that it would not stay with them. He became quite wild, living in the woods, catching mice, rabbits and even snakes for food, but when the first snow came he would come to us for shelter. That is how Peter came to live with us. He was a very large black and white tiger and really wild, but he was now older and we did not bother him so he decided to stay with us. He became almost like a dog, walking to the school bus stop with us and when we returned in the afternoon he was there waiting to walk home with us. During the 1938 hurricane when the top light went out and my father took me with him when he went to change the bulb. The blowing sand really cut my legs but inside the lighthouse it was totally silent as the walls were so thick. Each year before Christmas the “Flying Santa,” Edward Rowe Snow, flew over and dropped a package containing newspapers, magazines and candy. One year he misjudged and the package came right through the glass windows on the porch. Another year we were not at home when he came and we didn’t find the package, which was dropped some distance behind the garage, until after the snow melted in the Spring. 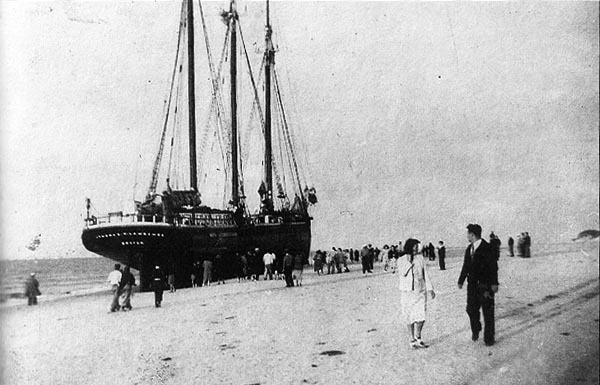 In September of 1939 a three-masted schooner, the Thomas H. Lawrence, was thrown up on the beach during a bad storm. It was bound from Rockland, Maine into New Bedford, Massachusetts when the storm pushed her over the sandbar in Ipswich Bay and onto Crane Beach. I remember awakening in the night to find the seamen in our kitchen. My mother made coffee and sandwiches. Only the Captain spoke English, with the seamen mostly of Portuguese descent. During the low tide backhoes were brought in to dig out in back of the schooner and on the high tide it was successfully pulled off the beach by tugs. My father and I were invited to go aboard by the Captain. My recollection is that it was very old and in poor condition. 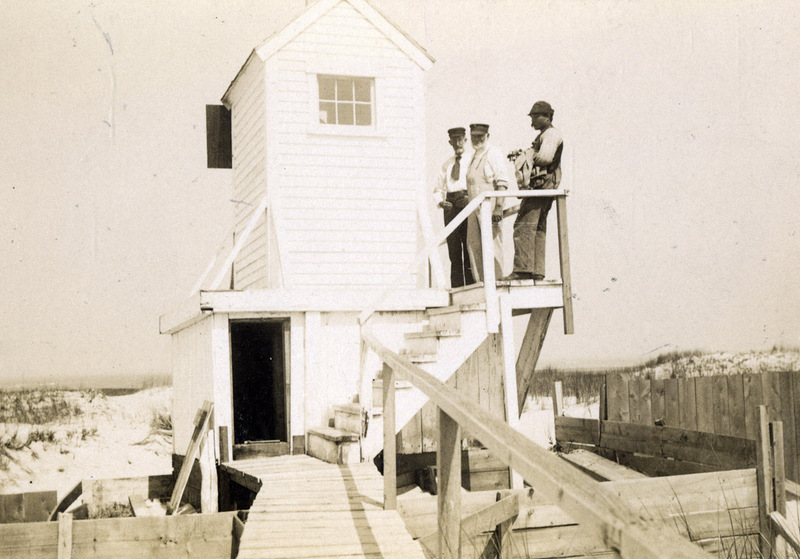 In 1938 the government decided to move the lighthouse to Edgartown on Martha’s Vineyard and replace the light at Ipswich with a steel tower, with the Coast Guard servicing the light. 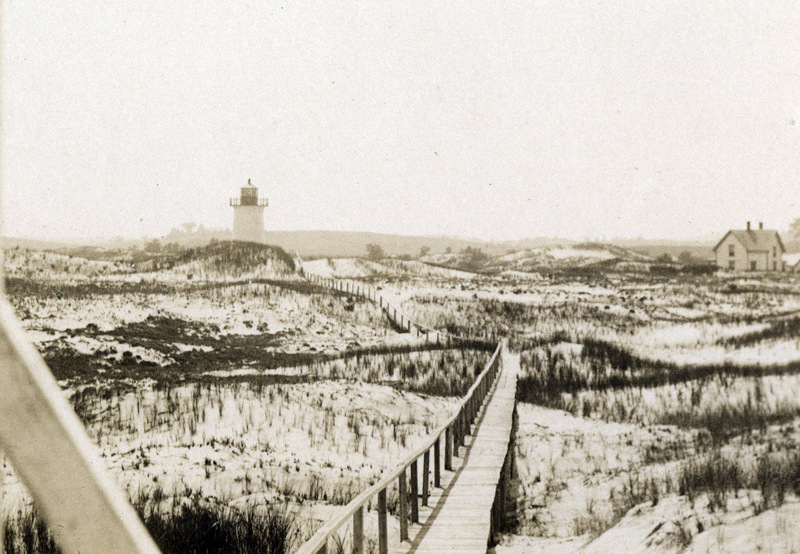 Despite efforts of local residents to keep the lighthouse at Ipswich it was dismantled and taken to Edgartown by barge. During the dismantling process the light was placed on a temporary wooden tower. One of the most prominent protestors of this move was Miss Susan Ellsworth. Her father, Benjamin Ellsworth, was keeper for fifty years from 1852 to 1902. 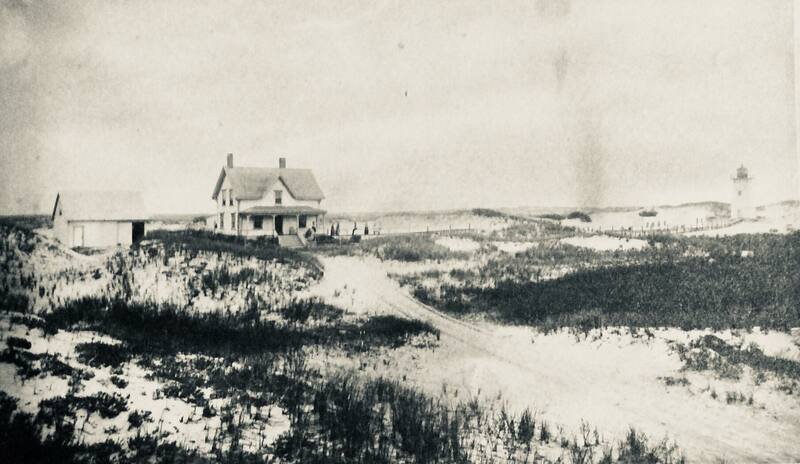 Her mother died soon after they moved to the lighthouse and she kept house for her father there. After her father died it is said that she maintained the light until a new keeper was appointed. She died in 1938. During the years Benjamin Ellsworth was keeper he planted and maintained an apple orchard. A fire and the shifting sands destroyed the orchard. However, I remember seeing the remains of some of the apple trees partially buried by sand at the time that we lived there. There was a cranberry bog in this area which was also covered by sand, but I remember picking cranberries. There were also many beach plums which we picked and mother made jelly. In those days we could walk the beach and dig sea clams which made a wonderful chowder. 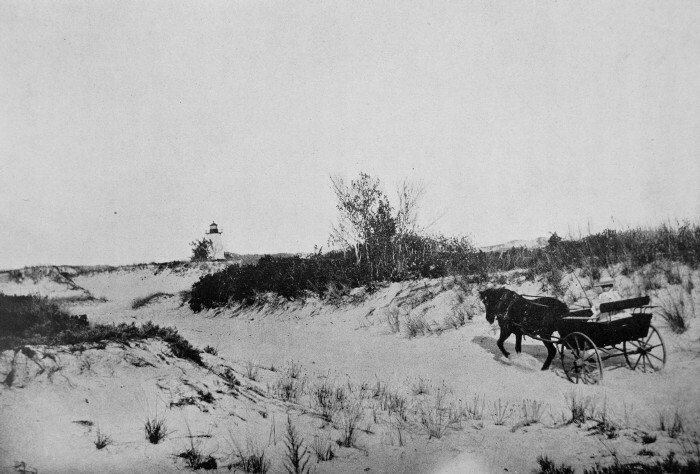 After World War II began in 1941 the Army established bunkers in the dunes and patrolled the beach with dogs as it was thought that German submarines might attempt to land at some isolated beach. One night the Army held maneuvers in which our house was the target and we awoke in the morning surrounded by soldiers. We remained at the Keeper’s House until 1942 when World War II created a demand for radio tubes and light bulbs and my father went back to work in this business. The Keeper’s house was later used by the Boy Scouts and the Girl Scouts and other local organizations, then rented to others for a few weeks during the summer for vacations. In October 1973, vandals burned the house and an era in Ipswich history came to an end. 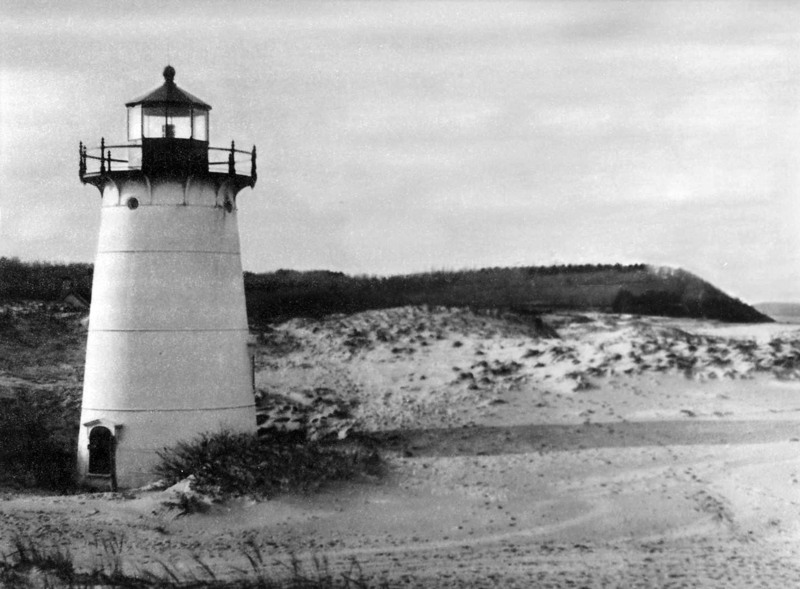 In 1939 the Ipswich Light was moved to a new home in Edgartown on Martha’s Vineyard. See more photos by Michael Blanchard.